We all know the best parties always end up in the kitchen and similarly some of our best stained glass ideas have ended up in the kitchen as well. The kitchen is a perfect place to add some design elements to your cabinet doors, pantry doors, transom windows or possibly a window at the side of your home which faces a neighbors home. 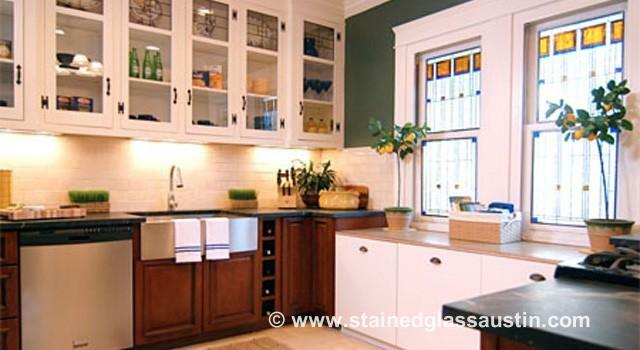 Kitchen cabinets are great places for some stained glass or leaded glass. You may have glassware or china that you want to be seen and not hidden away. Leaded glass in the cabinets made with non colored glass and soft textures, possibly incorporating beveled glass will give an elegant look and feel to the kitchen. Changing out the wooden shelves for glass shelves and perhaps installing a light inside the cabinets can be added features to consider. Pantry doors or wine room doors located close to the kitchen could be greatly enhanced with some stained glass designs added. Designs such as the grapes and leaves or perhaps a scene from a vineyard in Tuscany will be stunningly attractive additions to wow your visitors. Many kitchen windows face the side of the home and consequently the neighbors house. This view is not always the most attractive and additionally can give some homeowners concerns over privacy. The addition of some leaded glass will draw your eyes away from the ugly view and at the same time could stop viewing into your home from the outside. Your kitchen windows may be designed with smaller transom windows above the main glass panels. Often the main panels below will have blinds or other window treatments added but the smaller windows above will be left open to allow light to come in. This is the perfect spot to add decorative leaded glass which will still allow the light in and will enhance the interior aesthetics of the whole room.